Latin (botanical) name: Echinacea Angustifolia L.
Plant Description: The Echinacea plant resembles a black-eyed Susan in shape, but not in color. It’s petals are a bright purple and form an arrangement of florets around a cone-like center. It is a North American perennial that is indigenous to the central plains of Louisiana, Texas, western Oklahoma, western Kansas, and Colorado. It also grows as far north as eastern Montana, North Dakota, and around Manitoba, Canada. It grows on road banks and in fields and prairies. Interesting Historical Notes: The Plains Indians used the various species of Echinacea to treat poisonous insect and snake bites and other wounds, toothaches, and sore throat, as well as mumps, smallpox, and measles. Once the settlers realized it’s therapeutic benefits, it quickly became the most popular form of treatment for many illnesses. Since the early 1900’s, hundreds of scientific articles have been written about Echinacea. By the early 20th century, Echinacea had become the best selling medicinal tincture in America, used for a variety of internal and external conditions. By the very early 1900’s, however, the American Medical Association dismissed it as worthless. It was still used, though usually more as a folklore cure. By the 1930’s, Echinacea was rarely ever used in the United States. Europeans, however, began growing and using the herb again, and popularity of the herb grew rapidly once again in the U.S. The plant is now one of America’s best-selling herb extracts. Medicinal Properties & Uses: Herbalists consider Echinacea to be one of the best blood purifiers as well as an effective antibiotic. It activates the body’s immune system which increases the chances of fighting off any disease. This popular herb has been used to help ward off the common cold and to relieve the symptoms of hay fever. The properties in Echinacea may offer benefits for nearly all infectious conditions. Studies show that Echinacea prevents the formation of an enzyme which destroys a natural barrier between healthy tissue and damaging organisms. Echinacea is an effective therapeutic agent in infectious conditions such as the common cold, and is known to reduce the severity of symptoms such as runny nose and sore throat. It may also reduce the duration of illness. The herb is also a mild antibiotic that is effective against staph and strep infections. Echinacea is used to effectively treat influenza, sinusitis, and upper respiratory infections, and herpes, an inflammation of the skin and mouth. It specifically strengthens the immune system against pathogenic infection by stimulating phagocytosis, T-cell formation, and by inhibiting the hyalurinadase enzyme secreted by bacteria to effect the breakdown of cell walls and the formation of pus. Echinacea has antibacterial properties which can stimulate wound healing. It is of great benefit to many skin conditions such as acne, eczema, psoriasis, burns, and insect bites. 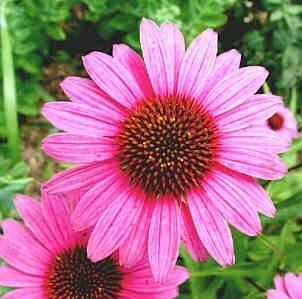 In addition, Echinacea has anti-inflammatory properties which may relieve arthritis pain. It has also been used in homeopathy treatments for such ailments as gastroenteritis, chronic fatigue syndrome, and indigestion, and even for weight loss. Dosage: 30-60 drops in water or juice, 2-3 times daily or as needed.